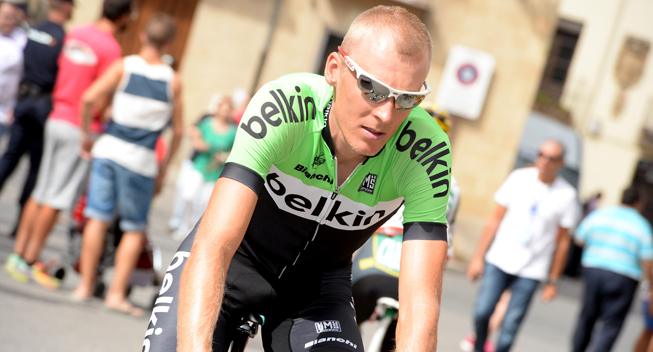 “The Algarve is my first race of the season after a long and hectic winter,” said Gesink. “For me, it's not a race that I’ll score in. My priority is to form a foundation for a good season." Team LottoNL-Jumbo is full of ambitions for the Volta ao Algarve next week, butwill not put its riders under pressure to perform. Sports Director Nico Verhoeven wants his team in Portugal to work towards bigger races later in the season. He has already set his sights on the season’s first big races. The Belgian opening weekend, Omloop Het Nieuwsblad and Kuurne-Brussels-Kuurne, marks the beginning of a series of important races. Robert Gesink and Kevin De Weert are at an altitude training camp in Tenerife, Spain. “We are curious to how they are doing in Portugal,” Verhoeven said. “The Algarve is my first race of the season after a long and hectic winter,” said Gesink. “For me, it's not a race that I’ll score in. My priority is to form a foundation for a good season. Tom Van Asbroeck, Robert Gesink, Paul Martens, Bram Tankink, Sep Vanmarcke, Robert Wagner, Kevin De Weert and Maarten Wynants.